While creating a website, the developers typically tend to give considerable importance to the navigation menus, as attractive menu buttons can lure visitors to click over them and surf other website pages. Menus, in a way, also contribute to the page-view and traffic rate of the website, thus adding to the website popularity and ranking. But creating attractive and stylish menu requires much effort along with a competent tool’s assistance, for which you can try using Flash Menu Factory 2.0. The utility aids you in creating eye-catchy and stylish flash navigation menu for your website. Even, the utility can easily be operating by beginners to create fantastic and attractive menus. For creating web menu, you can define desired text, add corresponding links, assign color, set size, etc and finally drive the impressive results. The utility also provides you with several 106 ready-to-use menu designs of high quality. Flash Menu Factory helps you in creating impressive and wonderful flash menus for your website. You can easily select any of the menus from the provided styles like Bubble, Underwater, Spotlights, Wild West, Signs, Hell Fire, Dynamite, Falling Star, Eyes, Lava Lamb, Snow, etc. While creating menus you can add eye-catchy animated graphics to give them beautiful appearance. Further, you can add icons, images, and sound effects to alter their look and feel. Along with these, it provides several customization features for modifying button color, text, font, style, spacing, style, mouse-over, background, and even more to give desired layout to the menu buttons. You can even change buttons size giving them a suitable height and width that goes well with your website layout. 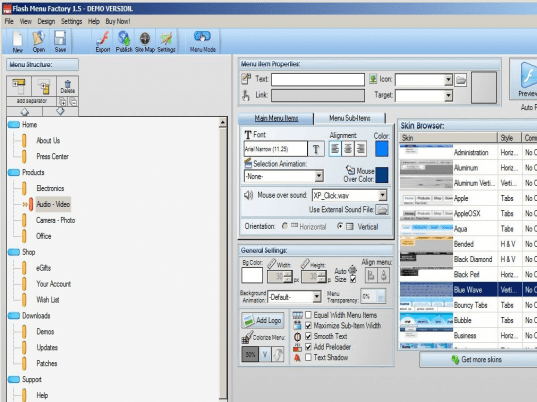 It also features animated backgrounds, pop-up animations, preloader, colorize function, web publishing wizard, and various other functions to work with. Flash Menu Factory software allows you to effectively create marvelous navigation menus for your different websites in quick time. Considering the extensive set of options followed by remarkable functioning capability, the utility is being rated with 4 points. Flash Menu Factory is a new software application that allows you to create stylish and impressive website navigation including flash drop down menus and more. Creating a flash menu is a matter of defining your text and the corresponding links, the rest is job of FMF. Flash Menu Factory comes bundled with 106 high quality menu designs. With so many menus the only problem is deciding which one to use! - 106 Designs (skins): 106 high quality different menu designs (skins) pre-installed. - Full customizable: Full customizable to the last detail (Fonts, colors, spacing, sounds, icons etc.) to meet the needs of your website style. - Easy to use: No flash knowledge or other programming skills are required. - Usability First: Designed according to Jakob Nielsen`s usability guidelines. Your users will never be confused by obscure navigation. - Button Maker Mode: FMF can also create stylish web buttons. For example you can use this mode to create an email button (protected from Spam robots) or other buttons for your website. - Creates classic menus as well vertical sidebars and tabs. - Additional skins are available on the web. - Add a preloader with a single click. - Colorize function will match any menu design with the color scheme of your web. - Simple, hidden and floating menus. - Menu files are always compressed in small size for fast web downloading. - A variety of popup animations (unfolding effects) is available. - Web Publishing Wizard ensures easy integration with your website. - Fanatical Technical Support for registered users. - And more: Popup animations, animated backgrounds, preloader, web publishing wizard, colorize function and more features are available for you.